WARNING: The use of a wire rope lifting sling requires that the cable angles be carefully determined to ensure that the legs are not overloaded - Never exceed rated capacity! Never Exceed Working Load Limits of the Wire Rope Lifting Sling. ** Rated sling capacities of basket hitches are based on minimum diameter of curvature at the point of load contact of 20 times the rope diameter. Wire Rope Material: The lifting slings are made from independent wire rope core (IWRC) offering less stretch and resistance to crushing while maintaining sling flexibility. Wire rope slings are fabricated from extra improved plow steel (EIPS). A low quality wire rope sling can cause injury and damage. A look-alike wire rope sling often found at lower prices is also often advertised to conform to the same safety standards (if at all). Be aware that it may refer to safety ratings in effect decades ago. So for example under the same safety standard a decade ago, a wire rope sling may be rated to 100% without proof load testing while today it may be 300% with proof load testing. Be assured that we only sell the highest quality wire rope slings and our advertised safety standards conform to the current ASME standards. Working load limits (capacity) of the wire rope lifting slings vary depending on the angle of use. The capacity is reduced as the angle of use declines. 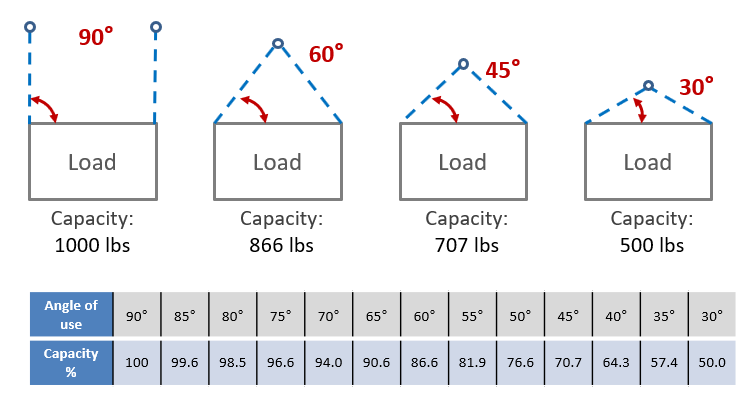 See drawing below how a 1,000 lbs sling capacity is reduced as the angle of use declines. The capacity of the sling is always highest at a 90 degree angle of use and smallest at an angle of 30 degrees (or less). The wire rope sling is not quite as durable. The wire rope sling is not as flexible as chain but its greater stiffness can be an advantage if it has to be inserted through a small opening or beneath a load. However, when wrapped around a load, the wire rope sling often tends to deform permanently to the shape of the load. Wire rope suitable for slings comes in a variety of grades and constructions. In most cases looping back and securing the loop with a metal sleeve terminates the rope. This forms a loop or soft eye, the simplest form of sling end. Thimbles are used to support and protect the eye from abrasion. Wire rope is generally cheaper and lighter than chain which can be a plus, particularly for applications that require long sling lengths. The nylon and polyester slings have the advantage of being lightweight in comparison to chain and wire rope slings. They are very flexible and relatively soft; therefore, they are suitable in applications were minimal damage to the load's surface finish is important. The rope is made endless or terminated with an eye by means of a handmade splice. Similar to a wire rope sling, various terminal fittings are available. Without adequate protection, nylon and poly slings are susceptible to being severed when impinging on even a relatively moderate sharp edge. Wire rope is often commonly referred to as cable; they are one in the same. Wire rope is composed of wires, strands, and a core. The basic unit is the wire, which is formed into strands. The strands are wound around the core. Various types of wire rope exist to meet a range of uses and operating conditions. These types are designated by the number of strands; the number, sizes and arrangement of the wires in each strand; and the way in which the wires and strands are wound, or laid, about each other. Important characteristics of wire rope relate to the number and size of the outer wires. A small number of large outer wires result in better resistance to wear and corrosion. A large number of small wires result in better flexibility and resistance to fatigue. The core acts as the axial member about which the strands are laid. Wire rope cores are made in two different forms. The one used most extensively is a wire rope of suitable size to serve as a core. It is called as independent wire rope core (IWRC). IWRC has increased tensile strength, offers less stretch, and is resistant to crushing; however, is less flexible. The other type is a wire strand core (WSC). This consists of a multiple-wire strand, and may be the same construction as the main rope strands. Two grades of carbon steel wire are offered. The bulk of commercial wire rope lifting sling is made from improved plow steel (IPS) or extra improved plow steel (EIPS) which has a higher tensile strength. Splices at the eye formation of the sling can be made by hand or mechanically (also known as "flemished"). Hand Splicing: Because no metal sleeve is required to secure the eye in the hand spliced sling, it exhibits more flexibility than mechanically splice slings of equal diameter. They have a more narrow profile and therefore can fit through tight spaces. Without benefit of a metal sleeve, lifts must be limited to applications where the wire rope sling is restrained from rotation and possible unlaying of the sling body. Mechanical Splicing: Mechanically spliced eyes do not suffer the limitations of hand splicing, are economical, and offer the highest rated capacity of any spliced wire rope sling. This wire rope sling is fabricated by unlaying the rope body into two parts, one containing half the number of strands, the other having the remaining strands and core. The rope is unlayed far enough back to allow the eye to be formed by looping one part in one direction and the other part in the opposite direction and laying the rope back together. The strands are rolled back around the rope body and a metal sleeve is slipped over the ends and pressed (or swaged) to secure the ends to the body of the wire rope sling. A wire rope sling is also called a cable lifting sling.